Special Features: Seven audio commentaries with cast and crew including Lena Dunham, Allison Williams, Jemima Kirke, Zosia Mamet and more. "To Hannah, taking her next step through a series of random steps." Whether they be personal or professional, opportunities don't always pan out. Even the seemingly life-changing ones. In fact, sometimes they completely backfire, and instead of enjoying the homerun success that we originally anticipate for ourselves… sometimes we just fail or quit or move on, and hopefully learn something from it all to help in our next endeavor. 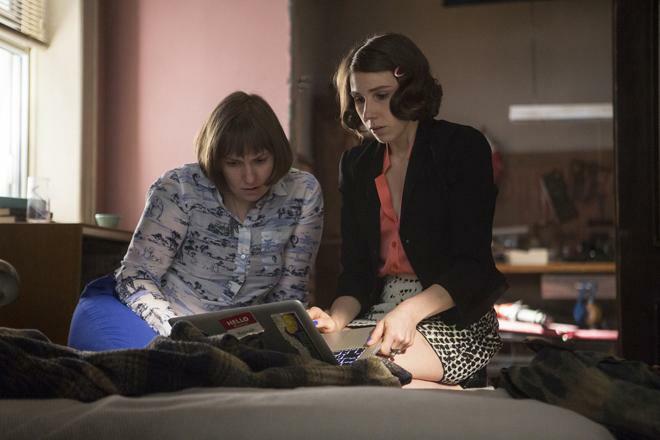 Continuing its examination of millennial struggles and flaws, the fourth season of HBO's 'Girls' focuses on a group of characters doing just that. But as they repeatedly reinvent their romantic relationships and career paths, the show and its protagonists finally do something that they've been putting off for years -- they start to grow up... and move to Iowa?! 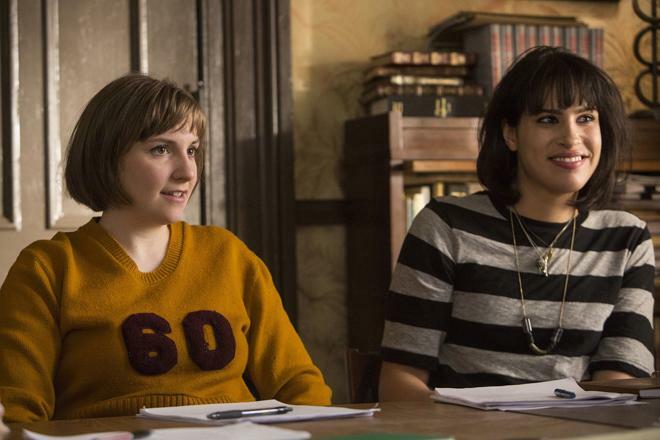 Picking up where season three left off, season four begins with Hannah (Lena Dunham) leaving New York to take part in the Iowa Writers' Workshop. Meanwhile, Marnie (Allison Williams) continues to pursue her music career, Shoshanna (Zosia Mamet) attempts to find a job, Adam (Adam Driver) adjusts to life without Hannah, Ray considers getting into politics, and Jessa (Jemima Kirke)… well, Jessa remains Jessa. As the characters' lives take them in different directions, various false starts lead to new chances, which lead to more false starts and more new chances… and so on. With Hannah relocated to Iowa at the beginning of the season, the show is allowed to develop slightly new dynamics between different characters. To this end, Hannah's misadventures in Grad School almost feel like an entirely new show with a new cast of supporting players. Thankfully, this ends up being a good thing, and the Iowa sequences breathe some fresh life into the series while milking some solid comedy out of the big city/small city juxtaposition. Of course, even in a new state it's not long before Hannah starts being Hannah, and watching her situation crumble and self-destruct is both amusingly cringe-worthy and rather sad. Likewise, the characters left in New York continue to engage in their own storylines -- and while this leads to one of the most disconnected seasons for the core protagonists, watching them grow on their own becomes paramount to the year's overall arc, allowing them to define themselves in new ways. But without giving too much away, Hannah does of course end up reuniting with the ensemble at some point, and the cast continues to play off of each other wonderfully. With that said, Hannah's reunion doesn't come easily, and her first episode back in NYC proves to be one of the season's most memorable. A "bottle episode" that takes place almost entirely in Hannah's apartment, the story focuses on a rather abrupt twist -- and the filmmakers do a great job of staging and shooting the action in the single location. Likewise, the twist fosters a certain level of genuine sympathy for Hannah -- something that's not always easy to muster up. In fact, as a whole, all of the characters come across as more sympathetic this year. That's not to say that they don't continue to be maddeningly irritating in sporadic bursts though. While this trademark annoying behavior usually carries just the right amount of humor and self-awareness from the writers, there are a few instances where certain decisions become a little too hard to believe. This is especially true for Hannah's behavior with a teenaged character later in the season, and her obliviousness to the repercussions of her actions seems unrealistic -- even for her. Likewise, another twist involving Hannah's father seems a little out of place (even if it was jokingly foreshadowed in season one), certain comedic beats clash tonally with others (Laird and Caroline, in particular), and Jessa's arc seems undercooked compared to the other characters'. To be honest, I'm finding it increasingly hard to evaluate 'Girls' on a traditional scale. Is season four actually any better or worse than what's come before? Not really. But it does present a subtle evolution of the same unique voice… and that's not a bad thing at all. More so than any other batch of episodes that has come before, season four features genuine steps toward growth for its characters. Well, they're more like stumbles than steps, but at least they're finally moving in the right direction. 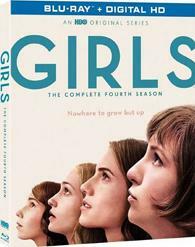 HBO presents 'Girls: The Complete Fourth Season' in a Blu-ray/Digital Copy Combo Pack. All ten episodes and special features are spread over two BD-50 discs that come housed in a keepcase with a cardboard slipcover. An insert with instructions for a downloadable UltraViolet/iTunes digital copy is also included. The packaging indicates the release is region A coded. Seven audio commentaries with cast and crew including Lena Dunham, Allison Williams, Jemima Kirke, Zosia Mamet and more. The show is provided with a 1080p/AVC MPEG-4 transfer in the 1.78:1 aspect ratio. Maintaining the quality found on the last season, this remains a great video presentation. With the exception of some very light grain-like noise in darker scenes, the digital source is essentially pristine with a clean, crisp image completely free of any artifacts. Detail is strong with pleasing clarity and depth, fully rendering every NY location, awkward interaction, and bemused expression. Colors stick to a slightly pastel palette of comparatively subdued but still rich hues. Contrast is well balanced with even whites and mostly deep blacks that avoid crushing. Though a bit muted compared to other punchier contemporary releases, 'Girls' comes to Blu-ray with a very pleasing and technically strong transfer. The episodes are presented with English DTS-HD MA 5.1 mixes, French DTS 5.1 mixes, and Spanish DTS 2.0 mixes with optional English SHD, French, Spanish, Finnish, Danish, and Swedish subtitles. Like previous seasons, this remains a dialogue driven experience, but key music choices and ambient effects are all employed well. For the most part, speech is clear and crisp, but there can be a very faint crackle to high frequencies in rare instances. While the soundstage is relatively modest, background effects like traffic and restaurant clatter are spread well throughout the front and back, adding effective layers of atmosphere to each location. Specific scenes, like an amusing encounter with a wild bat that flies around the room, offer livelier design work with smooth directionality and surround use when appropriate. Dynamic range is wide, especially in the show's music choices, and party sequences feature suitably powerful bass activity. Thankfully, all of the audio elements are balanced well together. 'Girls' doesn't exactly standout when it comes to sound design, but the mix suits the content very well and perks up nicely when it needs to. HBO has put together another extensive collection of special features, including commentaries, interviews, and deleted scenes. All of the supplements are presented in 1080p with DTS 2.0 sound. Commentaries - Commentaries are provided on episodes 1, 2, 3, and 5 with a variety of different cast and crew members. Participants include Lena Dunham, Alison Williams, Jenni Konner, Zosia Mamet, Jemima Kirke, and more. The various groupings all share good chemistry and offer laid-back and informative discussions on production issues, script changes, shooting choices, and Adam Driver's amusing refusal to ever actually watch the show. Deleted and Extended Scenes (HD, 13 min) – Nine deleted scenes from episodes 1-4 are viewable separately or together. These are all entertaining bits on their own that were likely cut for time. The material includes more with Shoshana's parents, Marnie's mom, and the Iowa Writers' Workshop group. Inside the Episodes (HD, 15 min) - Brief interviews with creator Lena Dunham discussing each of the five episodes on disc one are included. The featurettes can be viewed individually or together. Dunham elaborates on specific plots, guest stars, and character arcs. Commentaries - Commentaries are provided on episodes 6, 8, and 9 with different members of the cast and crew, including Alex Karpovsky, Lena Dunham, Peter Scolari, and Jenni Konner. More production trivia is discussed, including details on shooting locations and improvisation, rounding out an entertaining and worthwhile collection of commentaries. Deleted and Extended Scenes (HD, 14 min) – Seven deleted scenes from episodes 6-10 are viewable separately or together. Most of this material features more of Shoshanna's arc, and again, though worthwhile on their own, these bits were likely excised for pacing reasons. Inside the Episodes (HD, 19 min) - More interviews with creator Lena Dunham are provided, this time discussing episodes 6-10. The featurettes can be viewed individually or together. Marnie & Desi "Breathless" (HD, 4 min) – This is the full "Jazz Brunch" performance of the characters' song. Marnie Solo "Riverside" (HD, 2 min) – This is the full performance of the Marnie's song from the finale. The Making of Girls S4 (HD, 20 min) – This is a behind-the-scene featurette with interviews, on-set footage, and table read clips. Details on storylines, guest stars, songs, fake tongues, and creepy baby puppets are all shared. Though some of the info is repeated from the "Inside the Episode" featurettes, this is a solid inclusion. Gag Reel 1 (HD, 6 min) – Here we get an amusing reel of flubs that show the cast fooling around and having fun. Gag Reel 2 (HD, 6 min) – In case you didn't get enough, here's more flubs and assorted shenanigans. 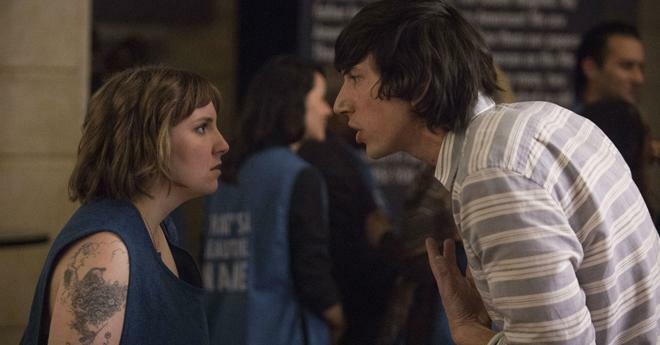 'Girls: The Complete Fourth Season' presents its characters at their most flawed, sympathetic, and ultimately brave. Funny and insightful, the show's unique voice remains equally entertaining and divisive. The video and audio quality are both strong with no major issues to report. Like previous seasons, HBO has put together a great collection of supplements, including seven commentaries and plenty of deleted scenes. Those who have yet to be won over by the series' singular "charms" likely won't have their minds changed here, but for fans of the show, season four is definitely recommended.